My semi-regular ramble on things that pop into my head ( thought poppers ) and other things that struck me and caused me to scratch my head while I’ve been away on this trip. First a thought popper ……. The date stamp on sour cream. What’s up with that? How much more sour could sour cream go? Now on to some Las Vegas oddities….. This guy. 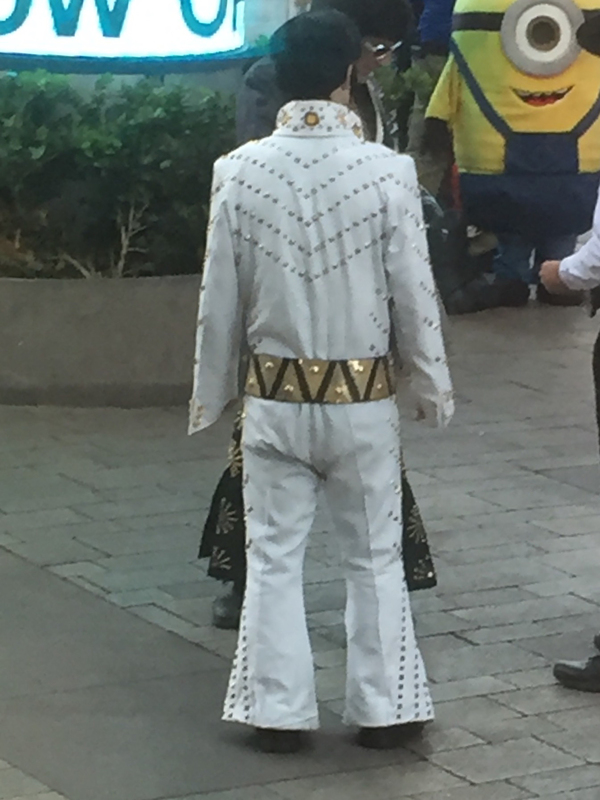 Elvis Saggy Pants. What’s up with him? Seems to me that if you’re going to try to lure tourists into a tip generating photo you might want to be wearing a suit that fits instead of a saggy diaper. And while we’re talking that guy lets talk about the yellow one-eyed guy too. What’s up with him? Finally, what’s up with people who don’t know how to behave in nice restaurants? I wish I had a photo to go with this one but since I DO know how to behave I didn’t have my cell phone up snapping pictures. On our last night in Las Vegas, Fancy Dining Dave and I had dinner at a nice restaurant. In the booth next to us were two married couples, in their early 30’s and several bottles in on the wine. With each guzzle from their glasses they got louder and more obnoxious. At one point one of the couples got up from the table to go to the bathroom (which we knew because they announced it ….at high volume). The remaining couple poured wine from the absent couples glasses into their own and ate food off the absent couples plates. The potty people returned, none the wiser. By the end of the evening one of the men was loudly describing his bedroom preferences using his best profanity and the two women ( still wearing their lighted and flashing convention lanyard) were kissing each other. I didn’t know when I made reservations that we were going to get dinner AND a show. So how do I wrap this one up? 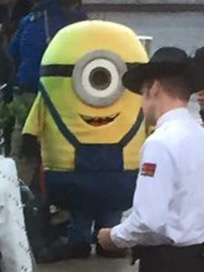 Sour cream, Elvis Saggy Pants, Tire Track minion and The People of Walmart Convention. Hell if I know. Please do remember to check the date on your sour cream though. Could be that Elvis has a saggy diaper because he didn’t. Now that definitely gave me a laugh. Glad my mind is not the only one to bounce from one subject to another.